Viral video of how Oba of Lagos snubbed Ooni of Ife – Royal Times of Nigeria. There’s wide outrage on social media over a clip which shows the Oba of Lagos, Rilwan Akiolu seemingly shunning the Ooni of Ife. 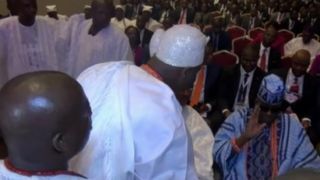 From the clip shared by TV360, the Ooni arrived at an unnamed event and was greeting the eminent guests who were already on seat. After greeting the traditional ruler beside Oba Akiolu, the revered monarch offered the Lagos king a hand in greeting, but the monarch looked away and dismissed him with a wave of the hand. The disconcerting moment was captured on camera.